A special chapter in the history of the hour record was written by Marcel Berthet and Oscar Egg >> (on the photo). From 1912 – 1914 the record was improved five times. Maybe this fight between the two cyclists would have lasted even longer, but it was ended 1914 when World War I began. Owen wrote this interesting story of the intense competition for the World Hour Record in 1985. This was before the UCI changed the requirements for the Hour Record and put Francesco Moser’s ride in a new category. Here’s an explanation and a history of the Hour Record’s progression. Like all sports with lengthy histories, cycling abounds with records and statistics. A special niche is reserved for the hour record; quite simply, the distance one can cover on a bicycle in an hour. To ensure fairness attempts have always been made on banked tracks. (In some places, such as England, records exist for certain straight line distances, all downhill!) Henri Desgrange, the Tour de France founder, established the first record of 35.325 km per hour on May 11, 1893. Ever since, the hour record has been revered as perhaps the most important indicator of pure athletic ability on a bike. It is a test of both speed and stamina without any possibility of the compromising factors mass start events allow. Moser and Roger Rivière are the only two to have broken their own records without someone else having broken them first. Even as these words are written the audacious Italian aims to establish an indoor record in Moscow. Francesco has become almost a one man hour record industry, this being his fifth assault. At age 36 it is his farewell legacy. Exciting as the recent attempts have been, they still lack the frequency and intensity of the two years from 1912 to 1914. In those days there were no distinctions about altitude vs. sea level or indoor vs. outdoor. There was only one hour record and in just 22 months it changed “owners” five times and was raised by 2727 meters, the largest progression ever for that period of time. As you might guess, such gains could only be made under the pressure of intense competition. In this case there were two giants determined to die in the saddle rather than relinquish the title. Marcel Berthet was the first on the scene when he pushed the standard to 41.520 kms, June 20, 1907, on the Buffalo track in Paris. (Buffalo Bill Cody had given his wild west show some years earlier on the site.) Berthet was careful, precise, and elegant in all he did. He even addressed the journalists as “Cher Monsieur”. His record ride was the logical outcome of perfect preparation and technical solutions to problems that he’d studied for a long time. All was tranquil until an audacious young Swiss rider (at age 22, three years younger than Berthet), Oscar Egg, burst on the scene with a stupendous effort that added no less than 840 meters to Berthet’s record. His 24 x 7 gear completely revised thinking about the size of gears a man could push for an hour. Berthet knew Egg from the six-day circuit and respected his abilities but not so much that he didn’t start planning revenge immediately. So much for his earlier pronouncements about never attempting the record again! He gave himself a year and was on target for an attempt in August of 1913 when news came on July 27 that a German, Richard Weise, had set a new record of 42.276 km. Egg was the first to react. He demanded a re-measure of the Buffalo track and was gratified that the original measurement had been off by 1.7 meters per lap. This boosted Egg’s record to 42.360 km and poor Weise was removed from the record books. But Egg had only eleven more days of grace. On August 7, Berthet showed he still had the touch when he upped the record to 42.741 km, or a 381 meter improvement. It was during this attempt that Berthet employed a system to inform him if he was ahead or behind Egg’s pace. Similar techniques have been used ever since. by pushing the record up an awesome 784 meters. Berthet was impressed, but not overwhelmed. He began work immediately on a new hour record bike. He ordered a frame with extra light tubes, a more upright fork and wood rims as thin as paper. He even went down to Milan to buy tires that were 15 grams lighter than anything in France. On September 21 the cycling world held its breath. Berthet didn’t disappoint. His new record of 43.775 km even stopped Egg from another attempt …… until the next year. on an unreachable shelf of 44.247 km. Berthet dreamed of another attempt after the World Championships in Copenhagen. The early sprint heats were interrupted by this announcement: “Messieurs, we have bad news. War has been declared between France and Germany.” Along with everything else, night fell on cycling. For nineteen years Egg jealously guarded his prize. 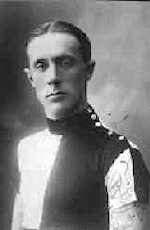 When a Jan Van Hout beat his record on the Roermond track, Oscar immediately demanded a remeasurement. He was delighted to see a recalculation that deprived Van Hout of over three meters per lap. The difference preserved Oscar’s record. In turn, Van Hout demanded another measurement and was vindicated to find the three meters had been way too big a correction, and that he had indeed beaten Egg’s record. In the meantime, however, on August 24, 1933, Maurice Richard definitively broke Egg’s old distance and Van Hout’s record, like Weise’s, never became official.